So, I just made my first all-grain brew a few days ago. Needless to say, I wasn't really sure how to do it, so here is what I did. Maybe it will help you out. I learned most of the information here from the guy at the Modern Homebrew Emporium in Cambridge, and Homebrewing Guide by Dave Miller. I am describing the step-mashing process, which is one of a few different popular methods. If you've tried one of the other methods, I'd love to hear about it. This process will add a few hours on to your brew time, and really make it into an all-day activity, but it will give you much more control and satisfaction over the end product. And, anyway, you don't brew your own beer because it's easy, right? I am assuming that you know how to do a basic extract-based brew, so I will just focus on the mashing process. After that point, it is the same process, except that you will have to boil more liquid. If you have a pot big enough to hold your whole batch, then you are all set. 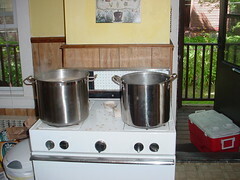 However, you may have to split your batch into two pots, like I did. One of the hardest parts about homebrewing in the summer is keeping your brew cool during the fermentation and conditioning stages. If your brew gets too warm, the yeast will produce off flavors, which can include grapefruit-like sourness and bannana flavors, and can also produce more fusel alcohols, which cause massive headaches the next morning. Usually, to combat this, homebrewers will make darker beers, with more complex flavors so that the off-flavors won't be so noticable. However, often in the summer you will want to drink something light, like a pilsner. You probably don't want something dark and heavy like a porter or stout on a hot summer day. The ideal temperature depends on the yeast that you are using, but 68 - 70 degrees Farenheit is usually a good target. This can be easily accomplished if you are lucky enought to have a central air-conditioning system that keeps your house at a constant temperature. Another really great way to control the temperature is with an old refridgerator. You can modify the thermostat to keep the interior at whatever temperature you like. This is really ideal, since it even makes it possible to make lagers, which need even lower temperatures. CPAN module to interface with the Lemur information retrieval system. One of my school projects involves writing a search engine using Lemur as a backend. So, I wrote a Perl module to parse the results. After the project is handed in, I will submit it to CPAN. Update to my utility for plotting multiple points on Google Maps. The Google Maps API has just been updated, including geocoding support. Hopefully this will make the geocoding much faster. Revamped Frisbee site. The new site is going to be written in Ruby on Rails, with a real database in the back end. It will feature RSS feeds, and I'd like to incorporate some AJAX functionality. That's all for now, but check back soon!